, bass [is] deep and taut"; "they need to be goosed with ample power to come alive." Features Midrange and woofers are designed and manufactured in-house; front- and rear-firing tweeters; unique cabinet with side panels, all of which can be ordered in different colors. Use "Small movements in any direction or changes in toe-in can affect the sound in obvious ways"; after placement, the next step is adjusting the tweeter levels via knobs on the rear of the cabinet. Value "The Revel Ultima Studio comes close to the goal of a great preamplifier: to pass the signal along with as little editorializing as possible." As we audiophiles sit and listen to our systems, which we may have put a great deal of effort and money into assembling, it's easy to lose track of the many variables inherent in the design of each product. This goes double for speakers. Think about it: All the main elements of a loudspeaker -- cabinet, drivers, and crossover -- are chosen and often refined to work with each other. Put different drivers in the same speaker cabinet and you get different sound. The same holds true for putting the same drivers in a different cabinet. And then there's the crossover, directing traffic as it were and doing its best to integrate the sound the drivers produce. So it's not a surprise that speaker companies like Wilson Audio, Thiel, Paradigm, API and Revel exist. These companies are as far removed from being advanced hobbyist/DIY concerns as possible, and much of what separates them is their adherence to the science behind the speakers they make. Research, testing, and refinement are at the heart of the products they produce, and the results, ah, speak for themselves. These companies know what theyre doing and produce speakers that prove it. Headquartered in Northridge, CA, Revel is the loudspeaker arm of Madrigal, which oversees the Mark Levinson and Proceed brands and is itself part of a larger entity, Harman International, whose product lines include Infinity and JBL. But Revel speakers are decidedly more upscale in aim and price than those from Infinity and JBL, as Revel's 10,000-square-foot laboratory and 10,000-cubic-foot anechoic chamber will attest. The Studio ($10,995 USD per pair) is the middle speaker in Revel's high-ticket Ultima line, which also includes the floorstanding Salon above and stand-mounted Gem below. The Studio uses a pair of Revel-designed and -manufactured 8" mica/carbon-filled copolymer woofers and a 5 1/4" inverted-dome titanium midrange. These drivers look unusual because of their silvery, metallic appearance as well as the omission of their dust-caps in the center of the cones. Also in use are tweeters manufactured by Scan-Speak and exclusive to Revel: a 1 1/10" front-firing aluminum-alloy unit and a 3/4" rear-firing textile-dome ambience unit. The output of both of these drivers can be adjusted via controls on the speaker's rear panel. Also around back is a large flared port near the bottom as well as two pairs of gold-plated binding posts. 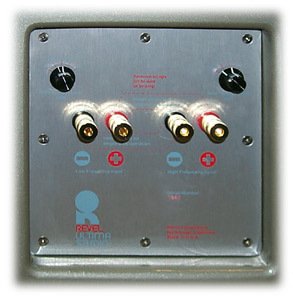 Revel includes gold-plated bars for connecting the pairs of binding posts in instances where owners don't want to biwire or biamp. Also included are screw-in spikes and novel covers that affix over the spikes to protect floors. The Studio's 24dB-per-octave crossover has its points set at 220Hz and 2.2kHz, which are said "to optimize the on- and off-axis response of the system." Revel doesn't supply much information on the Studio's sculpted cabinet except to say that "the main enclosure and internal bracing are designed to act as an acoustically inert platform for sound-wave generation." A knuckle rap indicates that the cabinet is very inert. The Studio is certainly unique-looking, more rounded than angular. It can be ordered in a host of different finish combinations, as you can specify the color of the speaker body and interchangeable side panels separately. After looking at the available finishes on Revel's website, I think the speakers I received for review, in heather gray finish with silvery aluminum side panels, is about the most attractive of the combinations. Separate grilles attach to the tweeter/midrange area via magnets inside the cabinet and over the woofers via the side panels, one of which you have to remove (via six recessed screws) before you can remove the grille. The Studio measures 43 7/8"H x 12 3/4"W x 19 3/8"D and weighs 164 pounds in its shipping carton, so roughly 150 pounds alone. Once spiked, the Studios are not speakers you can easily wobble from corner to corner to move because of their compactness and weight. I used the Revel Studios with my usual cast of reference equipment -- Lamm ML2 amplifiers and L2 preamp, Mark Levinson No.39 CD player, Bel Canto DAC1.1/Pioneer DV-525 DVD player combo -- as well as a host of other equipment. The low-power, single-ended Lamms proved to be a less-than-ideal mate for the Studios, which need power. So out went the Lamms and in went the Tenor 75Wi OTL monoblocks, a Mark Levinson No.383 integrated amp, and an Audio Research 100.2 stereo amp. I also used an Audio Research Reference Two Mk II preamp and Audio Aero Capitole 24/192 CD player with the different amps. Speaker cables and interconnects were from DH Labs (Q-10 and Air Matrix), Shunyata Research (Matrix and Aries), Acoustic Zen (Satori and Silver Reference), and JPS Labs (NC Series and Superconductor2). I biwired the speakers exclusively. Power cords most in use were Shunyata Research PowerSnakes Taipan, Python and Anaconda. Power was conditioned/delivered by either a Shunyata Hydra or Richard Gray's Power Company 400S. For direct comparison, I arranged to hold onto the pair of Wilson Audio Sophia speakers I reviewed late last year. The Sophia's $11,700-per-pair price is within shouting distance of the Studio's and thus makes these two speakers natural rivals. I initially set the Studio up in my office area, whose dimensions are almost identical to those of my 12' x 24' listening room, which is adjacent. After some burn-in time, I moved the speakers into the reference system and started the parade of amplifiers. Positioning the speakers in the listening room is a painstaking process -- anything less and you won't be getting everything these speakers have to offer. Small movements in any direction or changes in toe-in can affect the sound in obvious ways. But once things are right, the soundstage has its greatest expansiveness while the center image -- indeed, all images -- have strong outlines. I settled on placing them 49" from the front wall, 22" from the side walls, and toed in about 10 degrees, so the speakers fired just to the outside of my shoulders while I sat in my listening chair. However, once you've placed the speakers, you're still not finished. You need to adjust the levels for the front and rear tweeters. I settled on flat for both, but experimentation is especially easy -- listen, readjust, listen again. Once you have the speakers dialed in, install the included spikes and level the speakers -- side to side only for the Studios as the top of the speaker is not level itself. You do level your speakers after you spike them, don't you? Audio reviews generally cover a certain well-defined set of sonic parameters in the process of divulging what a component is about, and the performance of the Revel Studios seemed to command this. Their tonal balance is very neutral (although our measurements will tell this for sure), their highs extended and airy, their bass deep and taut, and their midrange very clear and detailed. They need to be goosed with ample power to come alive, but solid-state watts can be relatively cheap nowadays, and these are what the Studios thrive on. The Studio's thing is precision -- the ability to pass on the signal with ultimate resolution and very low perceptible coloration. If you want to hear into recordings, these are speakers you should audition. Ambience, air and spatial cues are all rendered in a believable manner. Images exist in their own space and often appear outside the speaker positions. While recordings like Radiohead's Kid A [Capitol CDP 7243] show how well the Studios can define sonic "objects," it is with classical works like the JVC XRCD reissues of classic Reiner/Chicago Symphony and Munch/Boston Symphony performances that the Revel Studios make their high-resolution nature known. The massed strings on Pictures at an Exhibition [JVC XRCD JMCXR-0016] were silky through the Studios, but it was also apparent that a 40+-year-old recording is playing, as the dynamics were a bit restricted compared to the very best recent recordings. But this door swings both ways. With less-than-perfect recordings like Wayne Kramer's Dangerous Madness [Epitaph 86458-2], you will know immediately that something is terribly wrong and probably relegate the disc to the in-the-car-only pile. Such is life with a speaker like the Revel Studio: Get ready for the truth and nothing but, whether you want it or not. The Studio's treble is very extended, but this extension does not come at the price of grit or hardness -- unless it's in your upstream equipment or recording, that is. The lower-treble/upper-midrange region sounds clean and clear, which helps with the portrayal of all that air and ambience, but in this there is also a slight sense that this region is highlighted as the sound transitions into the midrange. Voices sound uncolored in any way by the speakers themselves. My standard vocal test is Greg Brown, whose chesty singing can point out a too-mellow or overly warm midrange in a minute. On "Where is Maria?" from Further In [Red House RHR CD 88], Brown's warbling on the chorus is defined and utterly lifelike. I found the Studio's bass to be the region that drew most of my attention as I began to discern what the speaker did. The tight character of the bass makes it easy to think the speakers don't go as low as their specifications indicate. The sense of weight is not as great as what you will hear from other speakers, even those costing far less. But the depth is all there -- play a recording with a big bass drum, like Telarc's of "Fanfare for the Common Man" [Telarc CD-80078], and you may be startled. But my reference WATT/Puppy 6 speakers, for instance, portray the wallops with more heft, which travels in quick waves throughout my listening room. The Studios get the character of the bass drum right, but not with the same amount of energy as the 6es. Bass guitar, like that on Dean Peer's Ucross [Redstone Music RR91012], is quick, nimble and expressive, but once again doesn't have the same body or projection as with the Wilson WATT/Puppy 6es. While I found the Tenor 75Wi to sound very good with the Revel Studios, especially in the treble and midrange, if I owned these speakers I would opt for a beefy solid-state amp of at least 100Wpc. I suspect that the Studios need at least this much power to reach their full potential in terms of large-scale dynamics, as both the Audio Research 100.2 stereo power amp and Mark Levinson No.383 were up to the task with "Fanfare for the Common Man" mentioned earlier. In terms of the sonic presentation these two amps had with the Revel speakers, the ARC amp sounded very clean and clear, rather like the Revel speakers themselves, while the No.383 was a little more full-sounding and meaty in the bass. I personally would choose the No.383 for use with the Studios, and I would bet that Revel voices the speakers with Mark Levinson electronics too. The two brands make for a synergistic match, one that may divulge more about the Studios with an even more powerful Mark Levinson amp. If you are shopping for speakers in the Revel Studio's price range -- or have even more money to spend -- you should seek out the Wilson Audio Sophia, a speaker I reviewed very favorably late last year. Given their similar prices as well as the companies from which they come, the Sophia and Studio are natural competitors, and I would be surprised if there are any stores in which you can hear both. So what will you hear when you make the effort to audition these two five-figure titans? The differences I hear, and they are considerable, come down to a matter of vocabulary -- the words that come quickly to mind when describing each speaker. With the Studios, I keep coming back to the audiophile lexicon -- neutrality, detail, air, and ambience retrieval. There are few reviewing terms that the Studios don't address in a positive way. Likewise, the Sophias offer loads of detail and neutrality, but they also sound more relaxed and tangible -- more human. In their combination of traits, they seem to point toward a higher calling, one that puts them at one with the artistry, emotion and beauty of the musical message. To what specifically can this be attributed? I could speculate, but in the end it's a matter of all the elements of the speaker working together to present the music in this way -- it's not an accident. The sound of these two speakers most likely boils down to different sets of goals, and I can say that both the Revel Ultima Studio and Wilson Audio Sophia present music in ways that serious listeners will enjoy -- though probably not the same listeners to the same degree. One specific region I focused on with these two speakers was the bass, as my perceptions changed, and then changed again, over time. I A/B-ed a number of recordings and finally came to the conclusion that while both speakers go similarly deep, the Sophia's bass is more weighty. The Sophia's greater weight made discerning the similarity in depth a real challenge. Both speakers reach into the 30s, so neither needs a subwoofer. Wilson Audio and Revel make them, however, and with the Sophia and WATCH Dog at least, a combination I've heard, the results are very impressive. The Revel Ultima Studio is the kind of audio product that reminds us how much thought and execution go into making equipment aimed at re-creating live music. Its pedigree, as a member of the Madrigal family, is high, and its sound befits the effort that went into its creation and manufacture. Its highs soar and its bass plumbs, it can unravel a recording like few other speakers, and its overall precision makes it a very useful reviewing tool, provided the writer doesn't do most of his reviews on low-powered tube amps. While I am convinced that some listeners will prefer a speaker that wears its science less on its sonic sleeve, even these people should hear the Studio to know what's available, and possible, in the slightly-over-$10,000 price range. The Revel Ultima Studio comes close to the goal of a great preamplifier: to pass the signal along with as little editorializing as possible. How close is an issue that's impossible to address with certainty, but the Studio still raises it, which is an achievement. Price: $10,995 USD per pair.